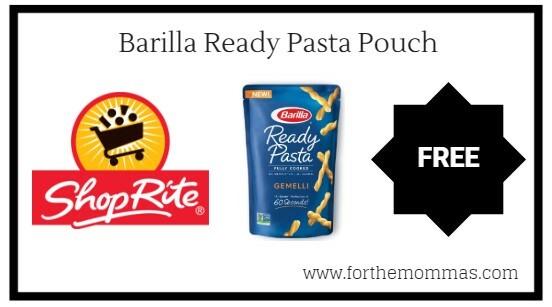 ShopRite: FREE Barilla Ready Pasta Pouch Thru 9/22! Thru 9/22, ShopRite will have Barilla Ready Pasta Pouch priced at only $1.74 each. In addition to this, we have a Barilla Ready Pasta Pouch printable coupon and a ShopRite digital coupon available to stack with this deal to make your final price FREE.